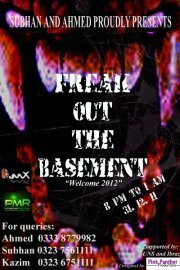 FREAK OUT THE BASEMENT NOW WELCOMES NEW YEAR '2012'. We bring you the most craziest and freaky evening of the year. Our party will literally make you go crazy and out of your minds! we'l try to make you feel your in some other planet with rocking aliens :p! And you surely will want more. Leave the responsibility to make you dance to the DJ Hash others and us! Your job is to come and dance the living hell out of your bodies. and we mean it! - Full security will be provided to you guys. Note: Entrance will only be by guest list, So dont wait, get your name entered! Hurry up, Times running out!